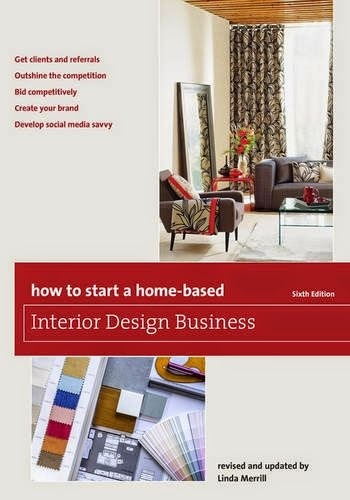 Early last Spring (as in 2014) I was contacted by an editor from Globe Pequot press about they upcoming 6th edition revision and update of their book How to Start a Home-Base Interior Design Business and they asked if I’d be interested in doing the job. It was great timing for my schedule at that moment and it’s always exciting to be published! And so, this week on the 15h, my book will official be released! During the process, the publisher was bought out by Rowman & LIttlefield and has been published under their Taylor Trade Publishing imprint. This is one of nearly 30 titles under the “How to Start ___ Business” book series which includes topics like Antiques, Bookkeeping, Children’s Birthday Parties, Day Care, Event Planning, Gift Basket, Handyman, Landscaping, Mail Order, Online Retail, Personal Chef, Photography, Professional Organization, Senior Care, Tutoring, Web Design, and Wedding Planning. All their books are written and edited by folks who have done the work, made the mistakes and have lots of advice to share. I’m a firm believer that the more professional we all are, the better it is for the industry and for the consumer. Whether we work in our homes or a commercial space – there is no excuse in today’s world to not take the job professionally. It’s not just about toss pillows and area rugs. This book is geared towards new business owners and those new to the interior design profession. It’s not just for decorating consultants but also for those who prefer to focus on selling a product such as carpeting, window treatments, flooring, and more. It’s a big business and lots of people play very important parts. To celebrate my book launch, I wanted to give away a signed copy! If you’re a student or just starting out in a design business, please share your story! Please make sure you include your email address so I can be in touch. If you prefer, you can email me your story as well. I’ll select a winner at random! Good luck! I graduated from a long distance course (called Sheffield at the time, now New York Institute of Design) when I was on maternity leave with my son, who is now two-years-old. I’ve since had a hard time getting started because I was juggling a baby and being back at work at Starbucks! However, I definitely haven’t lost my passion for interior design. Now on maternity leave after the birth of my daughter, I’ve been working on a friend’s living room to build up a portfolio and have been looking into resources about starting a home-based business – that’s where I came across your book! Congrats on having a book out, it looks like a great resource for people like me! Hi Jaden – congratulations on the new baby girl and your dedication to your interior design dreams. It must be hard to juggle everything, but I’m sure you will find success. I’m not sure if you’ve heard of Lauren Liess, http://www.laurenliess.com but she’s a designer in Washington DC/Virginia area. She’s been juggling kids (# 4 – a girl – just born a few weeks ago) and a very successful business. You should follow her blog as I think you will find it inspiring!